expect: PTO, health insurance, and maybe a tuition assistance credit here or there. But if you’re looking for creative and effective ways to stimulate employee engagement while also driving business results, you’ll want to consider the powerful impact of offering language-learning opportunities. Where’s the connection? And how can you reproduce these benefits within your organization? 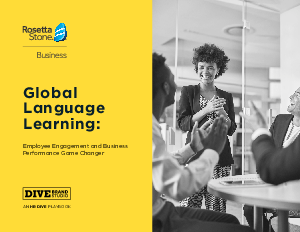 This playbook offers a deeper look at why language learning has such a positive influence on employee engagement and business performance, as well as step-by-step instructions for implementing a language-learning program in your organization.